Cut the pumpkin in half, remove the seeds, drizzle with some flax seed oil, sprinkle with some salt and roast in an oven at 375°F until the pumpkin is soft to the touch. Once the pumpkin is cool enough to hold, scoop out the pumpkin flesh and discard the shell. In a large pot, heat the 1 cup of flax seed oil over medium heat with the garlic cloves and cook until the garlic is soft and browned in color. Add the onions, celery, carrots, cinnamon, nutmeg and bay leaves and cook on medium high heat till the vegetables start to soften slightly. Increase to high heat, add the white wine and boil to reduce the wine by half. Add the cooked pumpkin, a large pinch of salt and the stock and simmer until all the vegetables are fully cooked and soft. Remove the soup from the heat, discard the bay leaves, add the maple syrup and puree in a blender in batches with the unsalted butter. Strain the soup through a fine mesh strainer and taste for seasoning, add more salt if necessary. 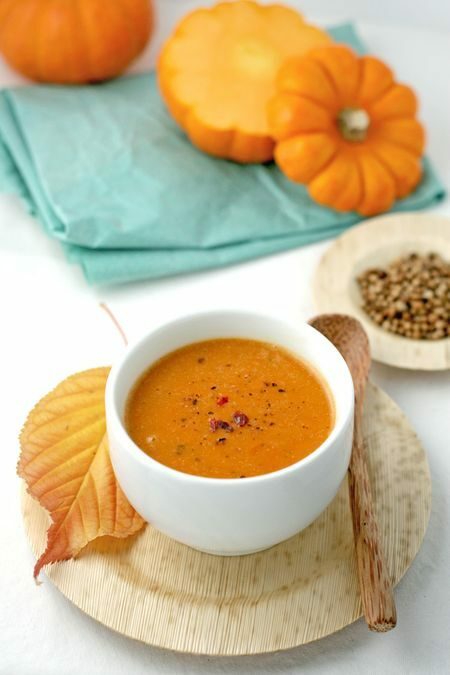 Serve the soup in bowls sprinkled with some toasted pumpkin seeds and parsley.